1. Combine the lemon zest, lemon juice, garlic, thyme, rosemary, salt and pepper in a large zipper-lock plastic bag. Seal the bag and shake well to blend. Place the chicken pieces in the bag with the marinade, pressing out excess air and sealing once more. Refrigerate and let marinate for 2 hours. 2. Preheat the oven to 425˚ F. Remove the chicken pieces from the marinade and transfer to a baking dish, skin-side up, reserving the leftover marinade. 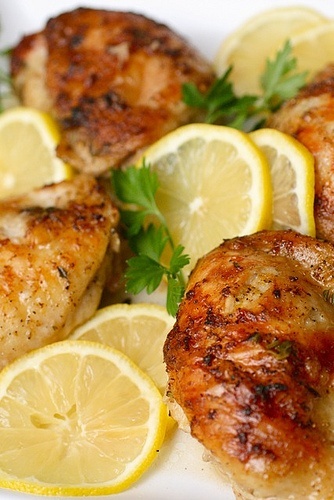 Brush the top of each piece of chicken with melted butter. 3. Bake for 50-55 minutes, until the skins are crispy and well-browned. Halfway through baking, pour the remaining marinade over the chicken pieces in the baking dish. Once fully baked, cover loosely with foil and let rest 10 minutes before serving. Transfer to a serving platter, garnish with lemon slices and serve.